Elbox news about DRAGON ColdFire: Enter the DRAGON ColdFire. ELBOX COMPUTER is proud to announce its breath-taking new product for Amiga 1200 computers - DRAGON ColdFire. DRAGON is a ColdFire-based accelerator card combined with the PCI/AGP Expansion busboard. With its DRAGON ColdFire development, Elbox brings to Amiga computers top performance of the latest Freescale's ColdFire V4e core based-processor, the successor of the 68k dynasty. DRAGON-equipped Amiga computers are ready to run most of the 68k Amiga programs/applications several times faster when compared against Amiga 1200 with the fastest 68060 accelerators. 'By combining many attractive features like the high-performance ColdFire processor, fast DDR memory, AGP graphics, powerful PCI 66MHz technology and comprehensive software support, DRAGON-equipped Amiga computers turn into modern, fast and extremely functional power machines,' said Maciek Binek, president and CEO of Elbox. The DRAGON's mainboard and the DRAGON's ColdFire CPU card are designed on two separate circuit boards. With modular design, the DRAGON can be easily upgraded and configured to meet the needs of the most demanding Amiga users. The DRAGON ColdFire will initially be available with the fastest ColdFire MCF5475 processor in clock speed of 266MHz. MCF5475 features the V4e ColdFire core with MMU, dual precision FPU and EMAC. The 266MHz version of the ColdFire MCF5475 processor provides raw performance of 410MIPS. The DRAGON comes with two DIMM slots for the DDR-266 SDRAM memory. This high-speed memory can rush data at up to 1GB/s throughput. As memory is scalable up to 1GB, you can add RAM to meet increasing demands of your applications and workflow. The DRAGON comes with the 3.3V 66MHz AGP slot which supports up to 264MB/s data throughput. The following AGP graphics cards will be supported: Radeon 9700, Radeon 9500, Radeon 9200, Radeon 9000, Radeon 7500, Radeon 7000, Voodoo 5, Voodoo 4, Voodoo 3. The DRAGON comes with five 66/33MHz, 32-bit PCI slots compliant with the PCI 2.2 specification. The DRAGON system can be configured with PCI 66MHz or PCI 33MHz expansion technology. All PCI slots provide DMA capability. The DRAGON's ColdFire processor has linear access to the 4GB PCI space. DRAGON hardware provides Multi-channel DMA support. 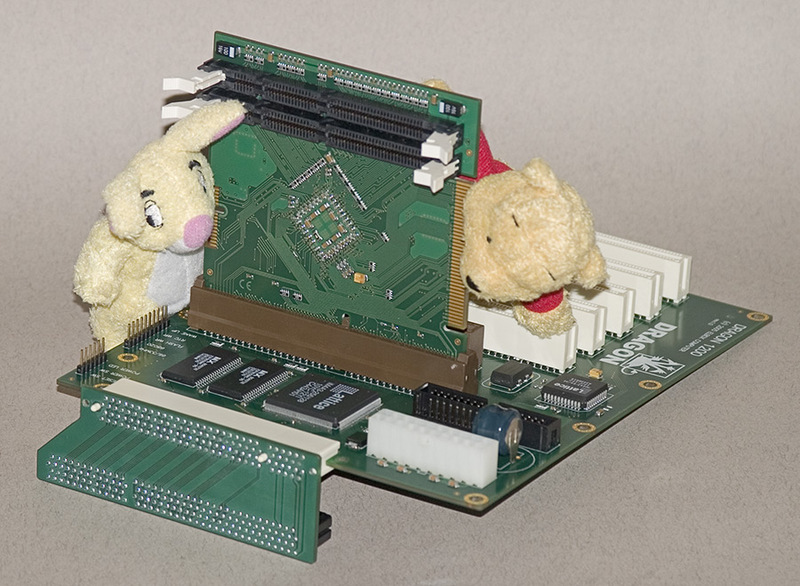 PCI bus master cards can provide DMA accesses to all DRAGON resources: the AGP card, DDR memory, other PCI cards and the Amiga 1200 motherboard space. DRAGON' PCI-to-DDR Direct Memory Access can reach up to 264MB/s throughput. This feature allows even the fastest mass storage PCI controllers to run at their top performance. DRAGON includes 2 MBytes of the 32-bit extremely fast Flash memory. It includes factory-programmed DRAGON's boot firmware and diagnostic software. Flash ROM allows remapping of the Amiga Kickstart, as well. The DRAGON's MCF5475 processor has one built-in Hi-Speed USB 2.0 interface and two FastEthernet 100Mbps controllers. External USB and FastEthernet ports will be available on an optional module. Hardware-acceleration encryption (DES, 3DES, RC4, AES, MD5, SHA-1, RNG) is built into the processor. Dual-channel architecture permits single pass encryption and authentication. Up to four programmable serial controllers (PSCs), each with separate 512-byte receive and transmit FIFOs for UART, USART, modem, codec, and IrDA 1.1 interface, are built in the DRAGON's MCF5475 processor. External ports for these controllers will be available on an optional module. The DRAGON ColdFire busboard is designed to be used in the following tower systems: Mirage 1200, E/BOX 1200, Power Tower, Winner Tower and Infinitiv Tower. Besides, an Elbox custom-designed case for the DRAGON ColdFire system will be announced soon. Update: D-BOX 1200 tower system is just available. As soon as the DRAGON 1200 sales starts, registered owners of Elbox MEDIATOR PCI busboards for Amiga 1200 computers will receive a special incentive upgrade offer. Update (31 January 2005): Unfortunately, things are not always going as expected. We planned starting sales of DRAGON cards for the end of January. Some of the subassemblies have not reached us on time, though. Therefore, the sales starting date will be slightly delayed. But we have also very good news for today: We have just completed the development and beta testing of the DRAGON drivers for ATI Radeon 9200/9500/9700 graphic cards. These drivers are the first Radeon drivers for Amiga computers, which support all overlay modes provided by these card' hardware: 15-bit PC, 16-bit PC, 32-bit BGRA, VYUY422, YVYU422, YUV9 and YUV12. These functions are crucial not only for using TV cards without any CPU load, but also for smooth playing of the compressed video files. Update (25 February 2005): Freescale has rescheduled the start of the volume production of the ColdFire MCF5475/266 processors from January to June 2005. Update (18 April 2005): Pictures of the production version of the DRAGON 1200 PCBs have been published in the Elbox website. Update (05 July 2005): The initial pieces of the ColdFire 5475 processors in the long awaited qualified MCF5475/266 version reached us today! So far only PCF5475/266, the engineering versions of this processor, were available. Next week, the CPU cards in the DRAGON 1200 boards, on which our developers work, will be replaced with new processor-equipped versions. Update (15 July 2005): The DRAGON 1200 CPU cards with MCF5475/266 processors reached our developers. Picture of the CPU card with fresh ColdFire processor has been published in the Elbox website. Update (12 August 2005): The DRAGON 1200 busboard CPLD's firmware has been successively adapted to the new signalling of the MCF5475/266 processors. It was necessary because, apart of the changes in the internal processor logic, the processors in the qualified version have also some changes in the external signals logic when compared against processors from the PCF5475/266 series (engineering samples), which were used by Elbox developers since mid 2004. Update (09 September 2005): Early this month our Freescale distributor informed us that the expected delivery date of the first production processor batch for us would be 27 September. If this is true, which we hope, the DRAGON 1200 boards sales will start by the end of October. In the meantime our developers work polishing software which will be bundled with DRAGONs. Update (01 August 2006): On 27 July 2006 we had presentation of DRAGON 1200 for a Freescale Inc. representative who visited Elbox Computer. The DRAGON 1200-based system on presentation was fitted with the Radeon 9200 AGP graphic card, the Fast Ethernet network card, the Hi-Speed USB and TV tuner cards, all working under AmigaOS 3.9. Update (11 November 2006): On 11 November 2006 we had presentation of DRAGON 1200 at Amizaduszki meeting in Krakow. Here are many pictures and movies from this meeting: pictures 1, pictures 2, movies: MOV and the same in MXVid. If you have any questions related to the DRAGON ColdFire busboard, email them at dragon (at) elbox.com. Answers to most frequent inquiries will be published in FAQ section of the Elbox website. Copyright © 1999-2019 Elbox Computer, Sp. J.